Roe triplane at Lea Marshes, May 1909. 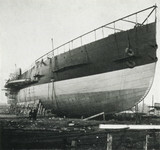 The 'Great Eastern' steamship before launching, c 1858. 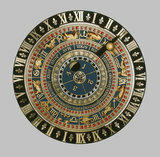 Hampton Court astronomical clock dials, 1540. Engines designed for the SS 'Great Britain', c 1843. Portable steam engine with threshing machine, 1851. Large Hindu planispheric astrolabe, 1870. Handkerchief bearing impresion of Henson's aeroplane design, 1842.